Member of Tri-Valley Orthopedic Specialists, Inc.
You are here: Home / Patient Education / Robotic Assisted Surgery / What is MAKOplasty®? 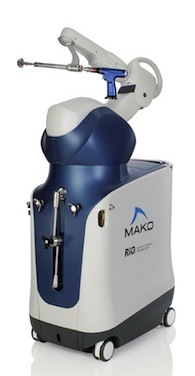 MAKOplasty® Partial Knee Resurfacing and MAKOplasty® Total Hip Replacement are enabled by the surgeon controlled RIO® robotic arm system, offering increased accuracy to optimize surgical results. Partial Knee Replacement is a treatment option for adults living with early-to mid-stage osteoarthritis (OA) that has not progressed to all three compartments of the knee. MAKOplasty® Partial Knee Resurfacing is an advanced treatment option. It is powered by the RIO Robotic Arm Interactive Orthopedic System, which allows the surgeon to perform surgery accurately through a smaller incision as compared to manual procedures. By selectively targeting the part of the knee damaged by OA, surgeons can resurface the knee while sparing the healthy bone and ligaments surrounding it. MAKOplasty® Total Hip Replacement is a breakthrough solution for adults suffering from painful degenerative joint disease of the hip who need a total hip replacement. It is powered by the surgeon-controlled RIO Robotic Arm System, which enables more accurate implant placement, which may reduce complications, such as implant wear and dislocation.